The double ended Browlight Duo pencil has a matte side and shimmer side that pair perfectly to help create your perfect brow look. The matte side hides stray brow hairs and helps to create definition, while the shimmer side accentuates your perfectly coiffed brows. Use Lacey's Browlight matte end to outline the top and bottom of your brows, then blend. What is lacey's browlight duo pencil? The double ended Browlight Duo pencil has a matte side and shimmer side that pair perfectly to help create your perfect brow look. The matte side hides stray brow hairs and helps to create definition, while the shimmer side accentuates your perfectly coiffed brows. This browlight works perfectly with all the products in Red Aspen’s brow system. What colors does lacey's browlight duo pencil Pencil come in? How does the lacey's browlight duo pencil work? Use the matte end to outline top & bottom of brows, then blend. Use the shimmer end to illuminate brow bones, then blend. May also be used to highlight inner eye corners, Cupid's bow, bridge of nose, and cheekbones. WHAT IS lacey's browlight NET WEIGHT? TELL ME WHAT MAKES lacey's browlight SO AMAZING? WHAT ARE THE BENEFITS OF lacey's browlight? How much does lacey's browlight duo pencil cost? Where can I purchase lacey's browlight duo pencil? 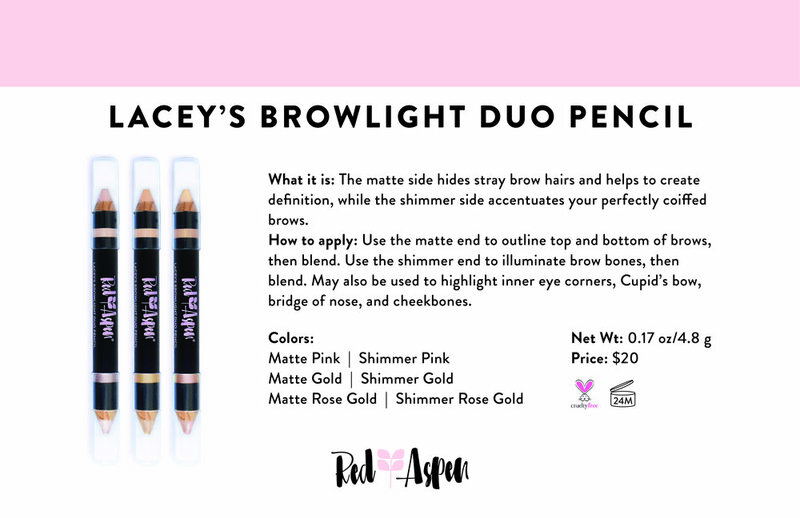 Is lacey's browlight duo pencil PV eligible? Can you add lacey's browlight duo pencil to your Loyalty Box? WHAT INGREDIENTS ARE IN lacey's browlight?